An alpine activity holiday is a popular holiday choice for families and for all the right reasons… doing adventurous activities together is a great way to spend quality fun time ‘en famille’ and create lifelong memories. Add the icing ion the cake by choosing a luxury accommodation as your base and you have the ultimate holiday experience! There are lots of beautiful places to stay in the Alps. Some specialize in gourmet food, others pride themselves in their choice of luxury furnishings and décor, others boast privileged positions with panoramic views and others have invested in providing luxury facilities and services to pamper their guests. You just need to choose which luxuries are most important to you when selecting your accommodation. Here are three of our favourite luxury places to stay in the Champsaur valley which is situated on the edge of the Ecrins National Park and boasts the best weather in the Alps - another important factor to consider for a successful activity holiday! The Serigues Chateau is an 18th century traditional stone farmhouse that has been renovated to a very high standard guest house offering three beautiful ensuite double bedrooms. The original stonework has been preserved wherever possible to preserve the traditional character of the property, but inside the rooms have been furnished and decorated in a luxury contemporary design with every attention to detail, making for a beautiful contrast. The luxury bathrooms all have walk in showers and quality fixtures to add the finishing touches to your experience. The property is situated high up on the mountain side with exceptional, unspoilt views overlooking the valley. With no neighbours in the vicinity, you really do have the luxury of peace and quiet in the mountains. Guests also have exclusive use of a well being room with hot tub, steam room and of course a view. You can stay at the Serigues on a bed and breakfast basis and enjoy a copious continental breakfast which is served in a beautiful airy breakfast room with access to the sun terrace and gardens, for guests. If you like a property with authentic character integrated with all modern luxury comforts, the feeling of space and peace and quiet then this is the sort of property that will suit you! 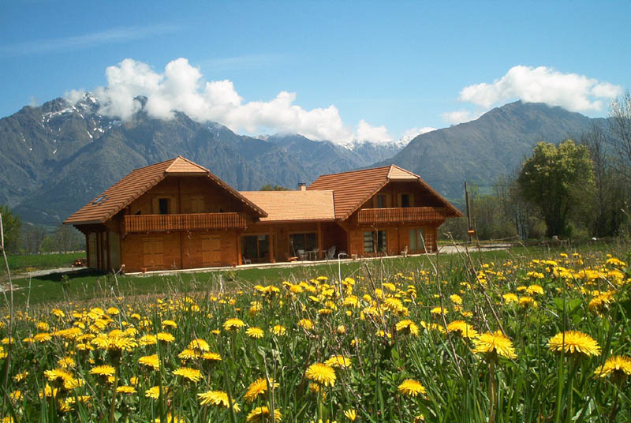 This is a beautiful alpine style wood chalet situated in 6000m of private grounds in a small alpine hamlet. 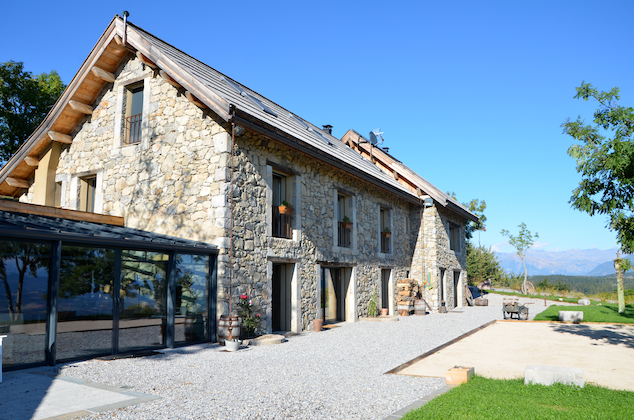 If you are looking for a chocolate box alpine style accommodation, this is the place! Forget all your worries as you sit on your sun terrace and take in the stunning panoramic mountain views on offer from the chalet. The extensive grounds are open access to all guests and it isn’t rare to open your shutters in the morning and see a deer or two grazing in the fields. You can stay on a bed and breakfast or half board basis, taking advantage of the owner’s home-cooked local specialities. The chalet has four ensuite bedrooms and one suite available to guests and all guests have use of the large and beautifully presented alpine style lounge area with open fire, comfortable sofas and dining table. There is also a well being room with infrared saunas and massages are also available – the perfect solution to aching muscles after a day in the mountains. If you are looking for luxury but want to be independent at the same time, then a self catering luxury chalet is the ideal solution and the Intiwasi chalet ticks the boxes!! The name Intiwasi is from Japanese origins and means house of the sun. A very apt choice as it is situated at 1600m on the sunny side of the mountain in the charming village of Chaillol overlooking the valley. The unusual Japanese influence is due to a historic relationship with a Japanese village that has evolved around an annual classical music festival which takes place every year in Chaillol. 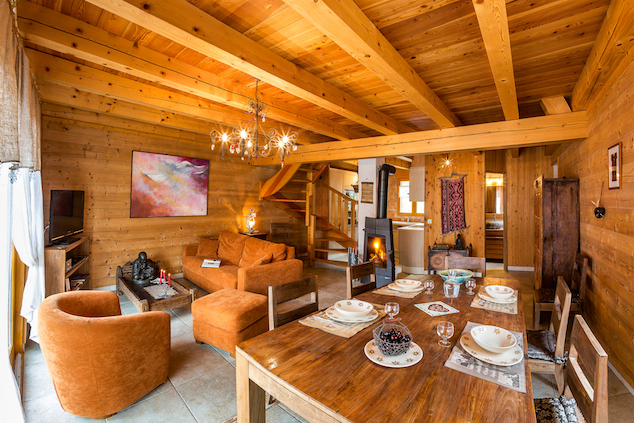 The chalet is part of a family of four other similar luxury chalets. Each chalet has it’s own private outside space and the Intiwasi also has a luxurious outside hot tub for guests to pamper themselves after a day in the mountains. The décor is unique in each chalet with special attention to detail to give each chalet it’s own character – a unique cross between Alpine and Japanese. In the Intiwasi chalet there are two bedrooms (a twin and a double with king size bed) as well as a mezzanine area for a third person or couple making it the perfect size for a family stay. Downstairs is a modern alpine style fitted kitchen with all mod cons and cosy living area with dining table, open fire and flat screen TV.